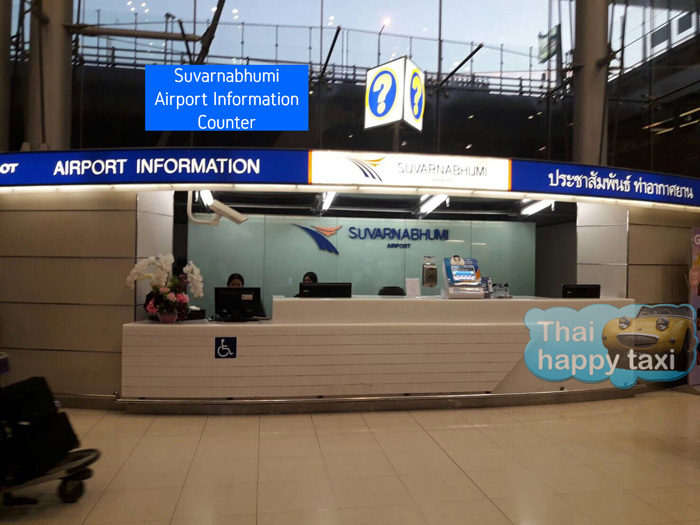 Please meet the driver at Suvarnabhumi Airport Information counter (near exit gate 3 on arrivals level (2nd floor)). 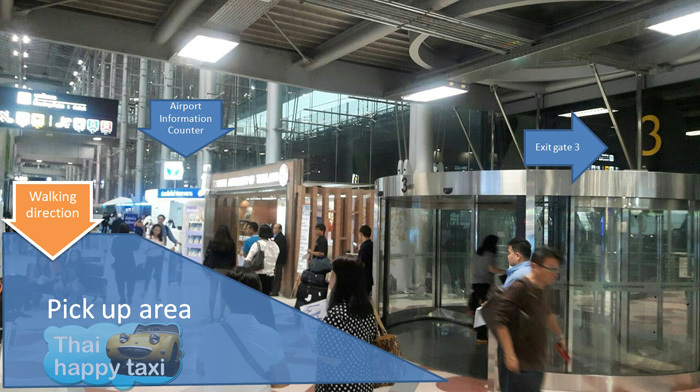 When you finish your immigration and baggage claim, just walk into the arrivals hall and turn right to walk pass gate 5 and gate 4 (Do not turn left or you will go to gate 6 instead). 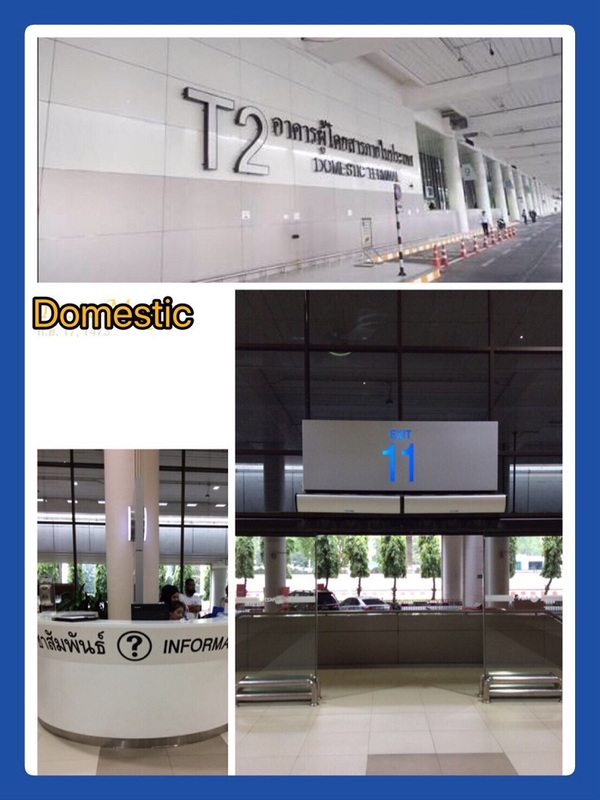 Keep walking and you will walk past the Airport Information Counter and come to the area in front of gate 3. The driver will be waiting there. 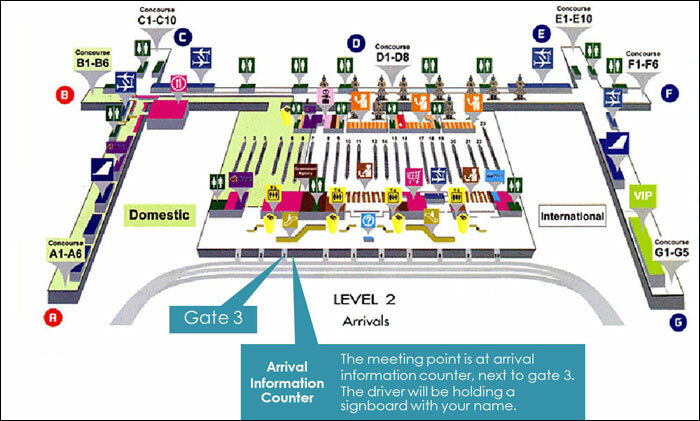 The gates are on arrivals level (ground floor). 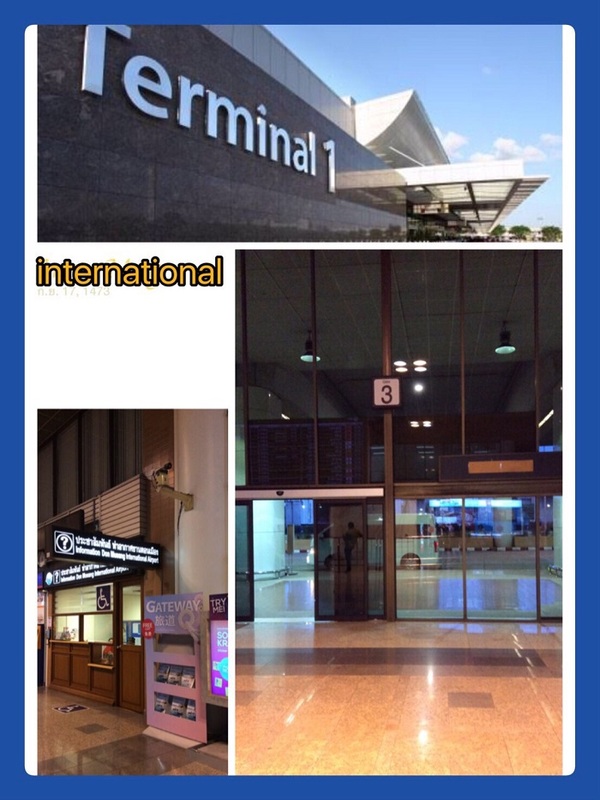 When you finish your immigration and baggage claim just walk into the arrivals hall and go to the respective gate, no need to take any stairs or switch terminals. The driver will be holding a signboard with your name and waiting for you in front of the gate. Please be ready for the driver at the main reception area in the lobby at the appointed time. Please be ready for the driver at the appointed time. He will ring the bell or give you a call when he’s out front. Our rates are all inclusive with no extra charges. Driver fee, tolls, fuel, parking and taxes are included. Please note Central Bangkok zone in green. 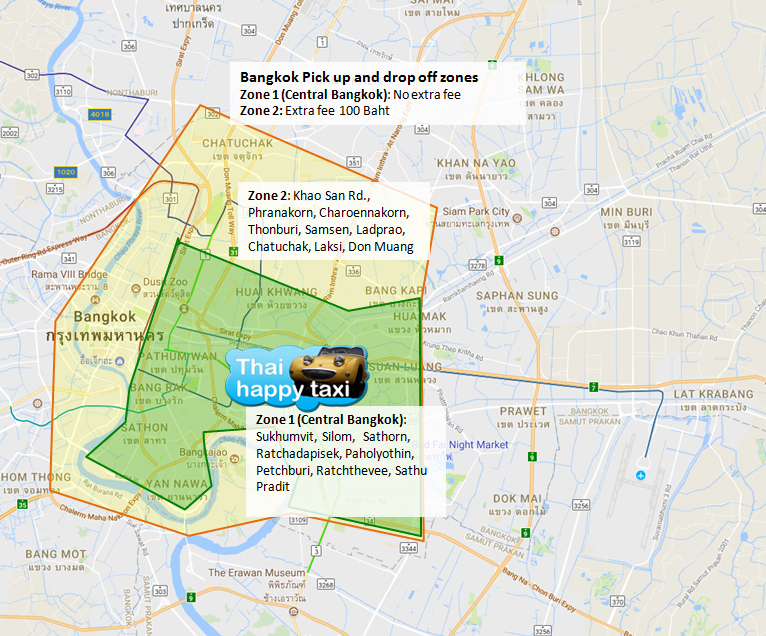 Pick ups and drop offs outside Central Bangkok have additional fee. All vehicles are new, in excellent condition, with seat belts and air conditioner. More than 24 hours before the trip: no charge. (One time only. Subsequent changes will incur 300 Baht change fee). Less than 24 hours before the trips: 300 Baht change fee. Once the trip detail is agreed upon we reserve the right to see if we can accommodate change requests. If we can accommodate, change fee of minimum 300 Baht per change will apply (depending on the scope of change). Changes less than 48 hours before the trip can't be accommodated. Reservation payment on private driving tour is not refundable. We’re covered with full public liability insurance in the case of accidents. However all visitors to Thailand should purchase travel insurance to cover themselves for the duration of the trip. Upon arriving at your destination please make sure to take all your belongings with you. The driver will take other guests after dropping you off and we cannot be held responsible for any forgotten items left in the vehicle. 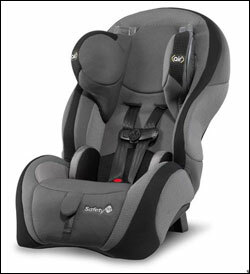 Top quality baby/child seats can be arranged upon request at 300 Baht per seat per trip. Please let us know the age and weight of the child when making booking. We welcome dogs and pets on our vehicles at reasonable extra charge on the condition that they are used to travelling, don’t get car sick, and don’t make a mess. We will inform you for the extra amount when confirming booking. 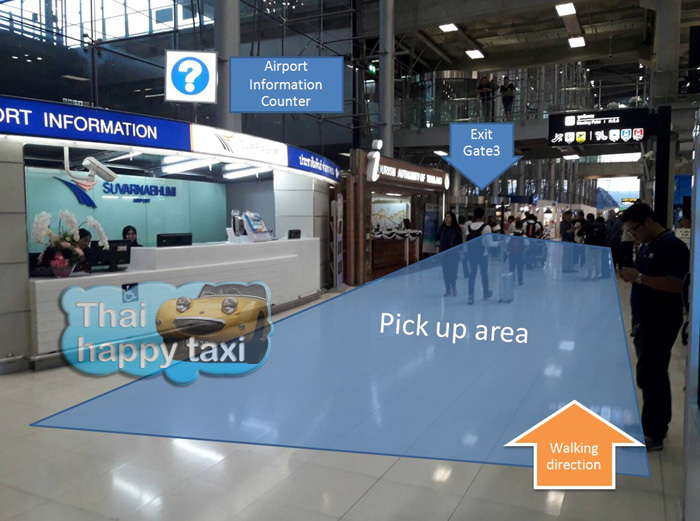 Our customers are special and we at Thai Happy Taxi will always try to provide best service to every one of them. However we reserve the right to refuse service to rude customers.